What is contemporary curatorial thought? Current discourse on the topic is heating up with a new cocktail of bold ideas and ethical imperatives. these include: cooperative curating, especially with artists; the reimagination of museums; curating as knowledge production; the historicization of exhibitionmaking; and commitment to extra-artworld participatory activism. Less obvious, but increasingly of concern, are issues such as rethinking spectatorship, engaging viewers as co-curators and the challenge of curating contemporaneity itself. In these five essays, art historian and theorist Terry Smith surveys the international landscape of current thinking by curators; explores a number of exhibitions that show contemporaneity in recent, present and past art; describes the enormous growth world wide of exhibition infrastructure and the instability that haunts it; re-examines the contribution of artist-curators and questions the rise of curators utilizing artistic strategies; and, finally, assesses a number of key tendencies in curating as responses to contemporary conditions. 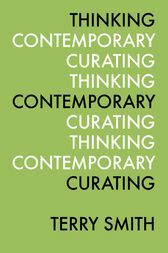 Thinking Contemporary Curating is the first book to comprehensively chart the variety of practices of curating undertaken today, and to think through, systematically, what is distinctive about contemporary curatorial thought. This is the eBook edition of Thinking Contemporary Curating, print form to be published in September 2012.